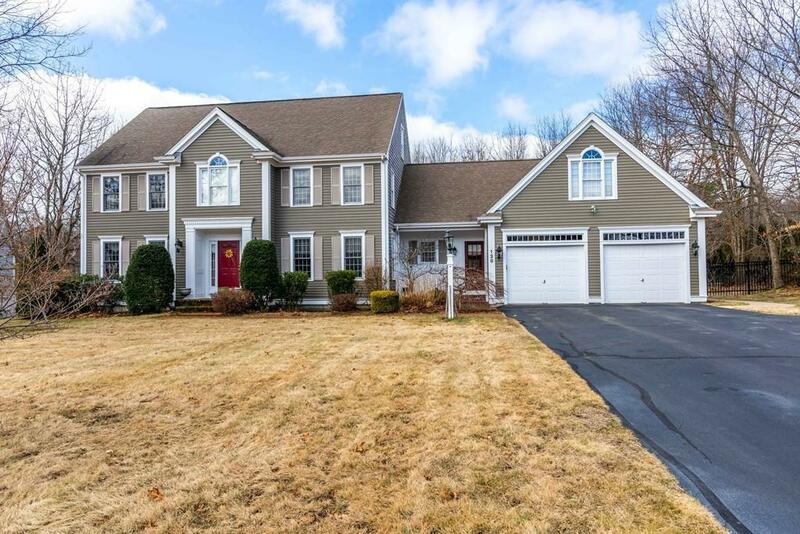 Located in the much sought after Marshfield Hills, cul de sac neighborhood of Blueberry Hill, this saltbox colonial sits on a generous one acre lot, only a six minute drive from the Greenbush commuter rail station. This four bedroom, family-friendly home has a flexible floor plan with a first floor office, a second floor family room, a two car garage, and an attractively finished basement bonus room. The saltbox living room includes a fireplace, a sky-lit cathedral ceiling and surround sound while the dining room is lovely with chair rail, a tray ceiling and wood inlay flooring. The nicely appointed kitchen is user friendly with a six burner stove, a farmhouse sink, double ovens, an island with seating for four and a kitchen nook with multiple pantries.The second floor master bedroom includes a dressing room/walk-in closet and a master bath with jacuzzi tub. Other features- a security system, 6 zone heat, 3 zone air conditioning, and beautiful 20 ft x 40 ft fenced in, in-ground pool.